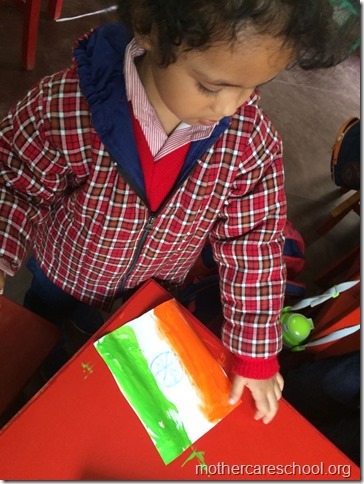 When I make my very own tri coloured rockets and march in the tri colour attire. 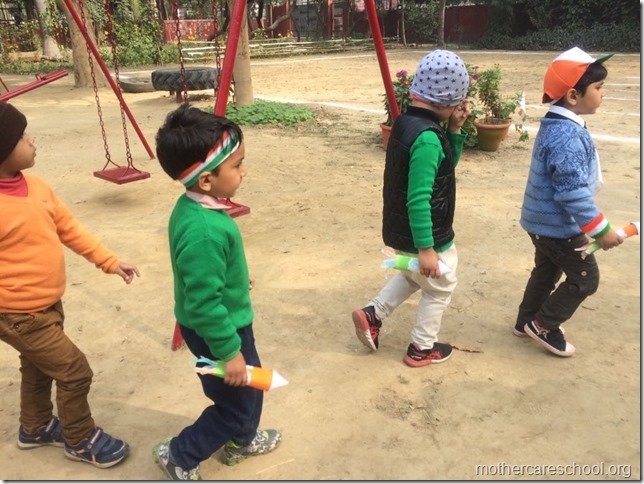 At Mothercare School we want learning to become fun for the child. To achieve this we have an activity oriented approach to learning. The curriculum is so woven into activities, that in the process of doing the activity the child automatically learns what we as teachers are there to teach. With a Teacher/ Child ratio of 1:20, our teachers are able to have their fingers on each child’s pulse. They are able to watch and see the beginning of anger, jealousy, insecurity, fear, negativity and such other traits in the child. Having been sensitized and trained in house they are able to address these issues through stories, dramatization, drawings, sand play, dance and music. Inculcating values in the children is a key part of their learning. This too is done through processes, projects and workshops so that the learning is experiential and not theoretical. The child wants to learn and know, he is like a sponge ready to absorb, as what is being taught enables him to do the fun activity well. Besides when the child does an activity, the concept becomes clear, he knows. There is no need for giving home work or giving test or exam schedules. On line evaluation is done while the activity is in progress. We ensure that appropriate stimulus is provided to each intelligence centre, each developmental area ie language, cognitive, music, movement, spatial, inter and intra personal relationships, fine and gross motor control, physical and sensory, aesthetic development. 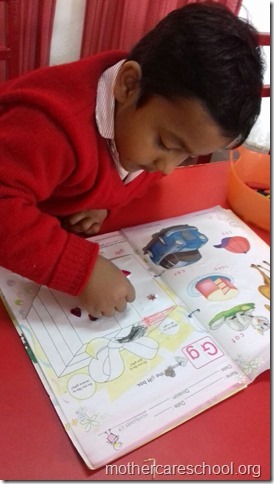 Simultaneously we focus on developing the skills required by the child to commence the formal learning process. With control on the fine muscles and sufficient preparedness in language and cognitive skills the writing, reading and mathematical skills come easily, without any barriers or resistance coming up at all. 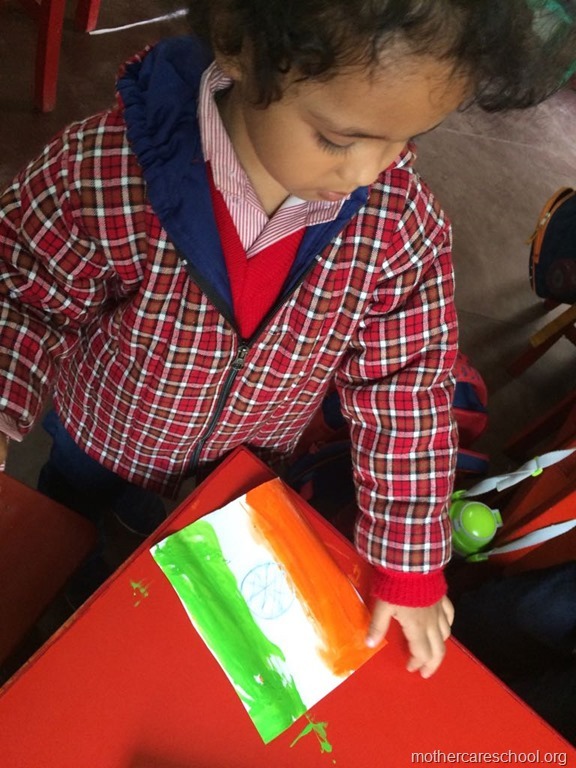 As per each child’s requirement, based on the online evaluation the teacher decides whether the stimulus needs to be continued, upgraded or simplified. This way each child is able to learn and move at his own pace. When children have constant exposure to various activities, they are naturally good at quite a few. We praise them sky high e.g., “Oh you bat like Sachin Tendulkar ” or “ you are an artist” or a poet. This truthful praise with a genuine basis, enhances the child’s self esteem and helps him to set his own milestones, benchmark. 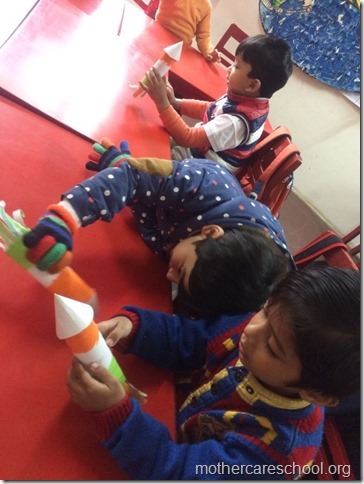 Once learning becomes fun, the child’s concepts are clear, requisite skills are developed and self esteem is high, his confidence level soars high. He has learnt the Art Of Learning, he has become a self learner. Our children are very aware of the people, things, activities effecting them and their surroundings. For this we have 2 month long workshops each to help them understand and imbibe the concepts of junk and healthy food, nutrition, health, hygiene / book browsing, storytelling and enacting, drawing the story and completing or making stories / ecology and environments / sharing, caring and belonging / all festivals / Aesthetic development and creativity / Yoga, kinesthetic, games and races. Obviously all this is a tall order and cannot be accomplished without all the stake holders that is the teachers and the parents giving their 100 % in a stress free, aware manner, fully equipped with the inputs needed to do so. 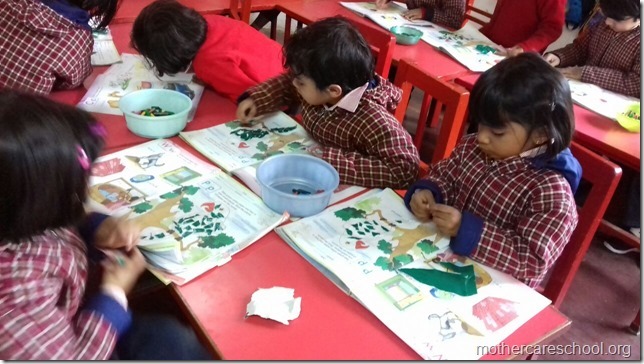 For this we have workshops and interactive sessions for both the teachers as well as the parents. Child psychology, how to make learning fun for the child, what works and what doesn’t work with children, how to remain stress free themselves. The school is an extension of the home and vice versa. Unless the home and school work together with common goals and methodology the child does not benefit fully. 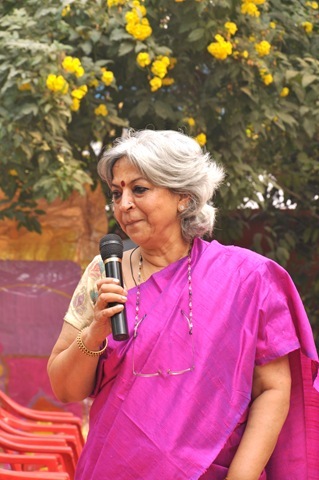 Mrs Shobha Dev has over 40 years of experience as an educator for children, parents and school teachers. She is also an Art of Living Teacher for The Happiness Program, Know Your Child, Know Your Teen and YES Youth Empowerment Seminar for Teenagers.